MooMama: Join the Lunchbox Brigade! In Food, Inc., filmmaker Robert Kenner lifts the veil on our nation's food industry, exposing the side hidden from the American consumer with the consent of our regulatory agencies, the USDA and FDA. Our nation's food supply is now controlled by a handful of corporations that often put their profit ahead of our health, the livelihood of the American farmer, the safety of their workers and our own environment. Food is being created with a bigger is better mentality but this way of thinking has harvested new strains of E.coli. This harmful bacteria kills nearly 73,000 annually! Our widespread obesity, especially among children, and the level of adult diabetes has reached epidemic proportions! 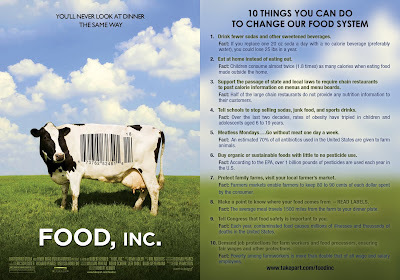 Food, Inc. reveals surprising, shocking truths about what we eat, how it's produced, who we have become as a nation and where we are heading through interviews with many experts and forward thinkers in the field! This movie opens today, June 19th! Go see it! Check these listings to see it is showing in a theater in your area. Also, click here to sign a petition for the Child Nutrition Act Reauthorization! By signing, you can urge Congress to make healthy food choices for our children in schools across the country. And don't forget, good food choices start in the home! Food Inc.: A Participant Guide: How Industrial Food is Making Us Sicker, Fatter, and Poorer-And What You Can Do About It by Karl Weber. For even more great books on this topic, click here! Lots of summer reading! Lastly, here is a *link* to the free postcard download shown above about 10 things you can do to change our food system! Print them and give out to friends and family.